Scandal got a little Lost this week. 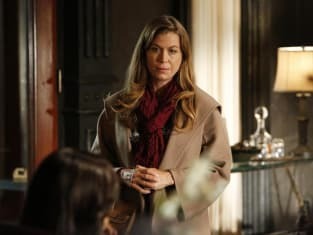 Actress Sonya Walger guest-starred on Scandal Season 4 Episode 3 as a woman in need of help after her daughter went missing. Aside from Olivia's Case of the Week (how great was it to see her back in action?!? ), we also witnessed Cyrus having an awkward run-in during a business breakfast, along with Jake using his connections to get some answers. Elsewhere, Mellie grew obsessed with a national news story and David went to great lengths to prove himself. How did that mission go? What sort of cliff were viewers left hanging from? Watch Scandal online to find out!